Air conditioning checks are not part of your cars annual service so it’s up to you to have it checked, with any car over two years old able to benefit from a re-gas. If you would like to see what other vehicle services we offer then please see our Car Servicing page. The most common complaint with air conditioning comes when the vents stop blowing cold air. More often than not, this is the first sign your car is due an air conditioning re-gas. Our expert technicians check the air conditioning lubricant and refrigerant levels in line with the manufacturer’s recommendations to make it as good as new. Look out for a musty smell coming from your car’s air conditioning; this is especially common if your air-con hasn’t been used for long periods and usually means that your Pollen filter also known as cabin filter is in need of an anti-bacterial clean or replacement to remove any bacteria build up on your system. Air conditioning units are prone to accumulating bacteria and dirt, which can impact its effectiveness, especially after long periods without use. An air conditioning anti-bacterial clean restores your car’s air conditioning filters, bringing back the crisp, cool air that should be coming out from your vents. We offer air conditioning recharge, anti-bacterial clean and an air-con bundle package for cars, vans and 4x4s at competitive prices. So put us and your system to the test today. 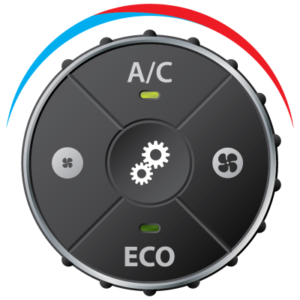 Air conditioning recharges and services should typically be carried out every two years, but it’s best to have your air conditioning checked as soon as you suspect that there might be a problem with the system, such as the temperature dropping, or an unusual smell coming from your system. A drop in gas pressure will result in a loss of cooling efficiency as well as making your engine work harder, which uses up more fuel. As explained earlier, our expert technicians conduct free air conditioning temperature checks to help put your mind at ease and if your car doesn’t need a refresh or a service, you don’t pay a penny.